Schmidt Double T Ranches is home to hundreds of Rio Grande Turkeys, offering you some of the most abundant hunting in Mason and Menard, TX—perhaps in the entire region. Our healthy turkeys can weigh close to 25 lbs. with an average beard length of 10 inches or longer and spurs of 1-1 1/2 inches. 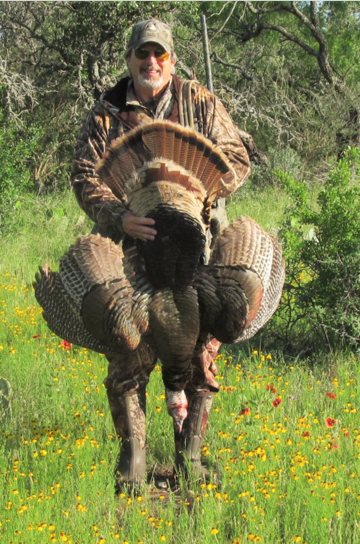 At Schmidt Double T Ranches, you will experience true Texas turkey hunting! 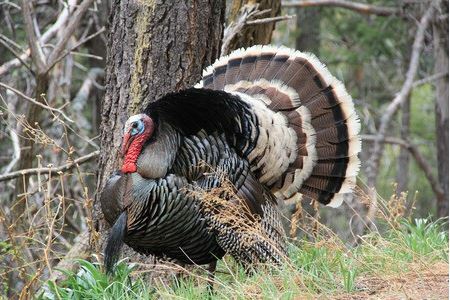 Our package includes a three-day, three-night stay at our comfortable lodge while you hunt for two Rio Grande gobblers. 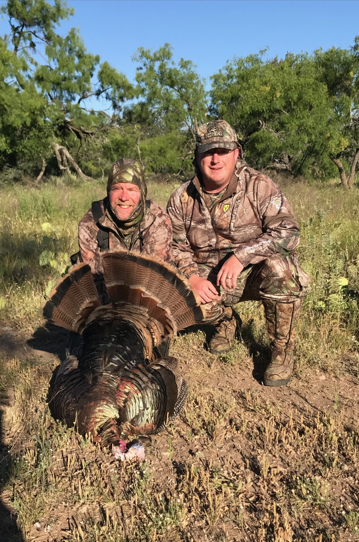 We offer semi-guided turkey hunts so that you can take advantage of our highly-experienced team of guides that understand the Rio Grande turkey and know the area well. 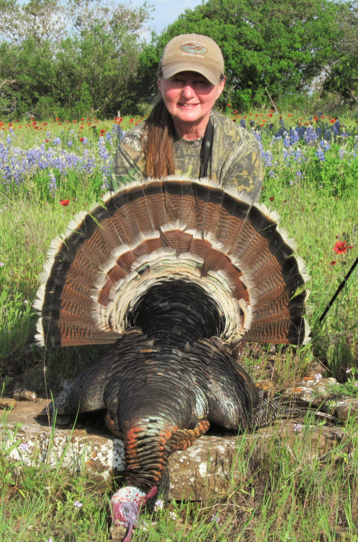 Our Texas turkey hunts take place in April and May, when Texas is filled to the brim with gobblers. You must put half down to confirm your scheduled hunt and your full balance is due March 1. If there are any non-hunting guests that would like to attend, the cost is an additional $300 per guest. 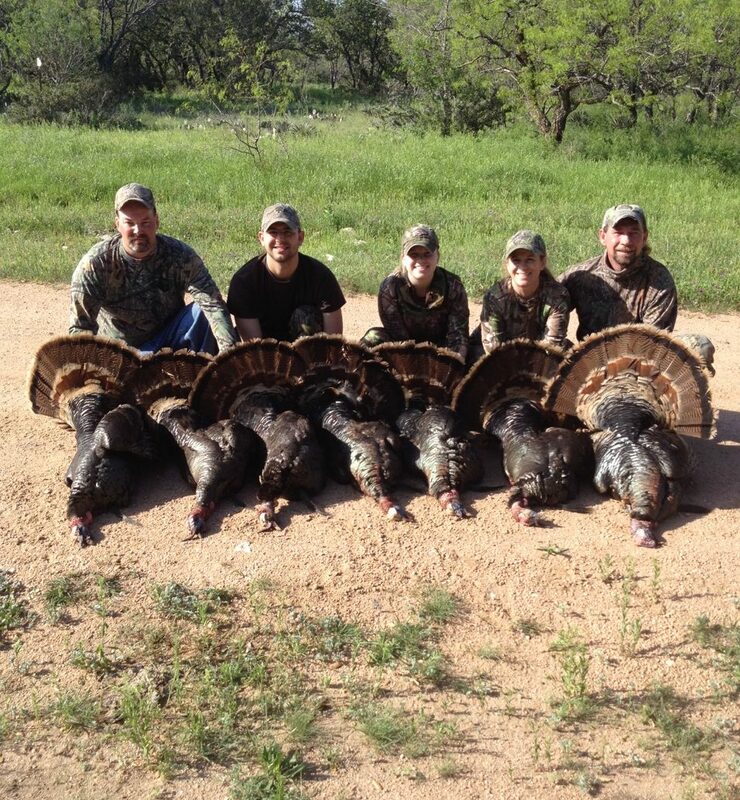 Call us at 325-347-2613 to book your Texas turkey hunt today! Schmidt Double T Ranches is made up of 3,000 high-fence acres, split into the Mason ranch and the Menard ranch. Before taking on the day to score your big game, it’s essential that you prepare accordingly. For our Rio Grande turkey hunts, proper gear and attire includes an orange cap or hunting vest, a layered hunting outfit catered to the weather, and comfortable boots. The right turkey hunting gear and what you wear on your hunt is vital to your success, so make sure you’re prepared! Once you’re ready to venture out, our guides will go over the area with you, as well as explain the gobblers’ travel patterns. After that, you’ll be let loose to find your two gobblers. When you come join us for a turkey hunt, you’ll stay at one of our cozy lodges, perfect for relaxing in after a busy week or resting up before your big turkey hunt. Enjoy home-cooked meals after a long day of big game hunting and of course, delicious homemade desserts! 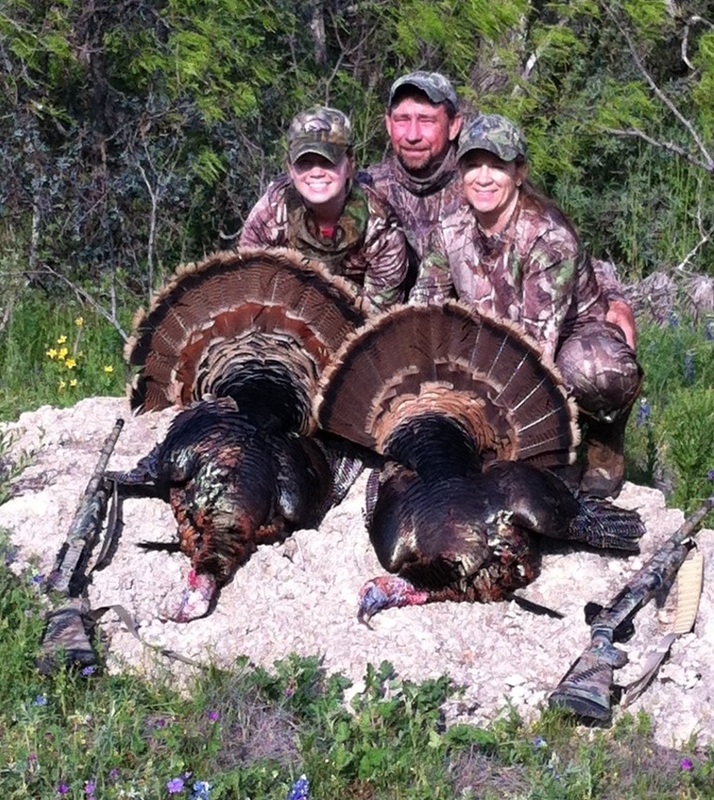 We have years of experience hunting turkey in Texas and our home is the Schmidt Double T Ranches. So, we may have a few turkey hunting tips and tricks to share with you along with some of the most effective techniques that we like to use to help you bag your bird. Whether you’re an avid turkey hunter or are just starting out, you’ll learn that a proper turkey call could make all the difference while out on a hunt. From the clucks and yelps, to the gobbler’s gobble, we’ll help you locate and entice your targeted bird so that you can stand triumphant with your catch at the end of the day. What makes the Rio Grande turkey such a satisfying catch? With 5,000 to 6,000 feathers, these vibrantly-colored gobblers are—fortunately for us—creatures of habit. They will spend their winters feeding in one place and then head to their breeding grounds in the spring, and if left undisturbed, they will continue these travel patterns. Hunting these big game birds becomes easier when you understand them and their habits. That’s what our professional guides are there for. We will help you locate the sought-after Rio Grande turkeys and create a game plan. We provide everything you need for success on your wild turkey hunt at Schmidt Double T Ranches except for your Texas hunting license! Bring your valid Texas hunting license prior to your hunt—we offer these for purchase if you are unable to obtain a license before your big hunt. All you need to bring to the hunt is your valid Texas Hunting License prior to your guided hunt, which we even offer for purchase. 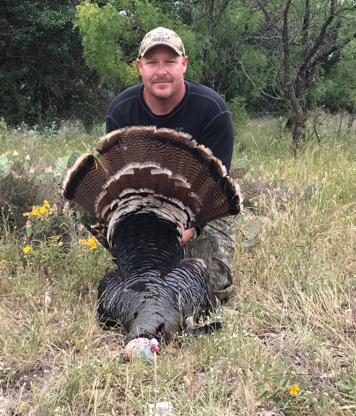 For more information on acquiring a Texas turkey hunting license, stamps and permits, please visit the Texas hunting and fishing regulations page from the Texas Parks & Wildlife. Why Choose Schmidt Double T Ranches? 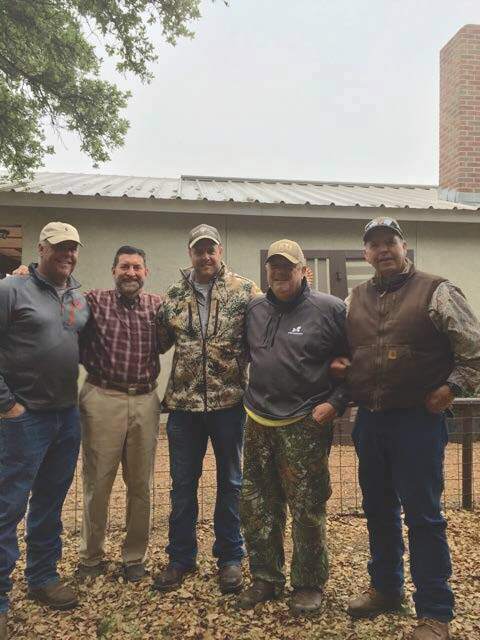 Turkey hunters throughout Texas speak highly of our accommodations and have hunted with us for many years. 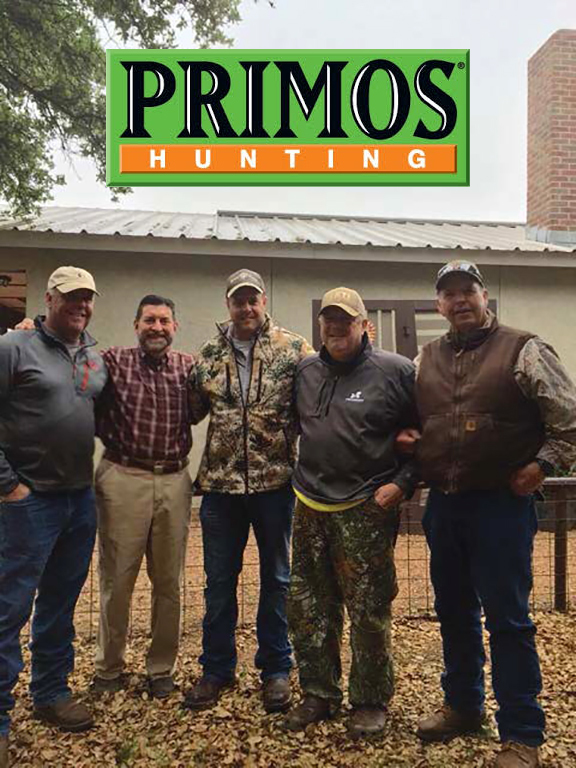 One of our long-time turkey hunters is Jimmy Primos, Vice President and owner of Primos Hunting. We are very thankful for the strong partnership and even stronger friendship he shares with us at the Schmidt Double T! So, what are you waiting for? 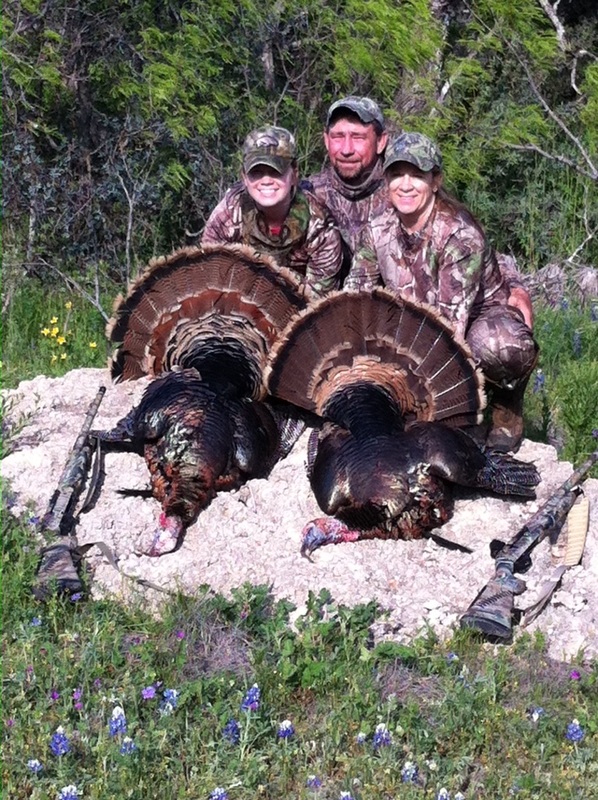 Come join us at Schmidt Double T Ranches for your next Texas turkey hunt! Call us at 325-347-2613 to learn more about booking or drop us a note today!